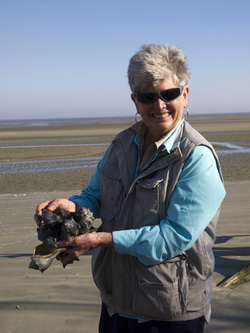 Betty Oliver, a native of St. Simons Island, GA, developed a passion for the ocean and the surrounding marshes growing up on the beaches of the Golden Isles. Attending Saturday art classes with Bill Hendrix, a highlight of her childhood, was the inspiration for continuing the study of art at the University of Georgia. After earning a B.A. in Art, M.A. in Art History, and Ph.D. in Art Appreciation/Aesthetics, Betty joined the faculty of Southern Polytechnic State University in Marietta, where she presently serves as Professor of Media Arts. She has studied with noted watercolor artists Tony Van Hasselt, Judi Betts, Linda Baker, John Salminen, Bettye Carr, David Becker, and Skip Lawrence. Betty is an active member of the Atlanta Artists Center, the Georgia Watercolor Society, the American Society of Marine Artists, Glynn Art Association, and the Ossabaw Artists Collective . She currently lives with her husband in a 150-year-old log cabin in Dahlonega, Georgia and maintains a home on St. Simons with the hope of retiring and returning home to the beach some day soon. Painting with watercolor is a wonderful antidote to my long days spent teaching computer graphics. I love the instant gratification of putting paint on paper, the excitement of watching pigments interact with each other, the surprise as the painting reveals itself. My favorite subjects, landscapes, reflect my love of being outdoors. Growing up on an island has left me with a constant yearning to return to the land of my childhood, and painting is the vehicle that takes me there in my imagination. Being a part of the Ossabaw Artists Collective gives me the opportunity to share my love of Georgia islands with others through my paintings.